Some of you may remember this post from back in February. It spoke happily of how Ali and I had found a new house just down the road in Nuneaton and of how we were hopefully looking at moving quite quickly to our new patch to be in by Easter. Since then, however, things have gone steadily downhill and the sale of our own house has fallen through, and in turn our proposed purchase. It’s really demoralising, not least because it’s not down to any of our own doing; it’s all collapsed due to the incompetence of our supposed buyer who failed to even apply for a mortgage until six weeks into this farce and now due to one reason or another has pulled out altogether. And so the process has to start again. The bunnies will be dry-cleaned, the house dusted to within an inch of its life and all those boxes that I pre-emptively packed some two months ago look like being redistributed to make things look as welcoming as possible. Somehow, though, I can’t quite see it being so frantic this time around as I don’t really have the heart for it at the moment. As I said right at the beginning “if it is meant to be, it’ll all go smoothly”, and obviously this particular one wasn’t. I thought I’d just show off my new Goobaa to fill the time before my next proper update. Last weekend, prior to the disappointment Liverpool felt this week, Ali and I were up in the city visiting some friends. We got shown around the centre itself taking in the docks, the Tate and the rest of the local culture, but by far and away the best aspect of the weekend was Go Ape. Go Ape is basically a playground for big kids, suspended from the trees. Consisting of various rope bridges, Tarzan swings and zip lines it forms a route through the canopy and is surprisingly good fun. I say “surprisingly” because I’m not a great fan of heights; put me on top of a tower with a handrail I’m fine, but put me up a ladder with a light breeze and I’m not so sure anymore. That being said, they break you in very gently and do their best to reassure you with a very lengthy and helpful safety talk about how your safety harnesses “love the trees”. It may not sound like much, traversing a few dangling ropes suspended from the branches, but it was really good funwww as first I got over my fear and then I embraced the challenge. Half of the obstacles were something straight out of Gladiators with wobbly beams, stirrup walkways, and giant cargo nets. Well worth the trip and definitely something that will wake you up early on a Sunday morning. The football scene at Rare is robust one; there’s the Tuesday evening kick-around, the Wednesday night league and during the summer a match post-work on Thursdays here at our very own Manor Park, which itself even sounds like a football stadium. To keep this level of football up we have a large pool of players to chose from and just as many understanding other-halves that allow their men to go out and kick pig’s bladders around several nights a week. We’re not the only development house in MGS with such commitment, though. 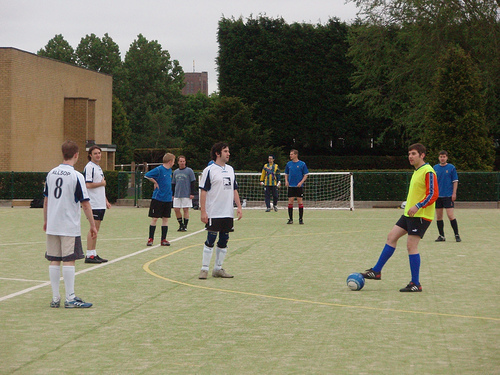 When our Head of IT went down to Lionhead, Guilford, a while back, he found an equally thriving sporting scene and it seemed only logical to pit their teams against ours in Rare’s first inter-dev match in many a year. We felt like an authentic away-day team driving down to Guildford yesterday afternoon; despite there only being just over a dozen of us, we were all sat upon a massive 60 seat coach, like the ones you see driving teams to cup finals, talking team tactics and deciding which of my defenders I was going to shout at most during the match. It was just as well we were given nice, plush transport, too, as it was a three-hour trip down into the centre of the M25 and when we finally emerged off the coach we couldn’t wait to get started. It turns out Lionhead are used to this sort of thing as they already had a predetermined ‘A’ and ‘B’ 7-a-side team ready to go. We, who usually pick the teams based on who is available on a certain night, opted for a slightly different approach as our manager-for-the-day split us up into “offensive” and “defensive” sevens, which made our American team members feel right at home. Due to my goalkeeping habits, I obviously went on the defensive team, which suited me just fine as I always feel more confident knowing that there are some defensively minded people willing to stop back and help cover the danger. And so it began. Badly. 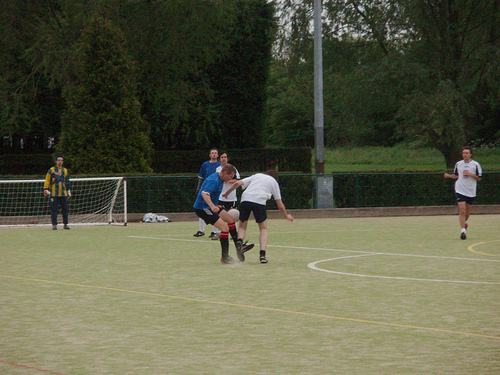 In our first game we conceded within five-minutes as a break on their left saw them power into the box and unleash a shot. I managed to get hands to it but gallingly it wasn’t enough as it simply diverted the effort onto the post and eventually dribbled over the line on the rebound. They were well organised and we were sure we were playing their A-team; every time they pushed forward they looked dangerous and it was only due to the combined efforts of the defence and I that we managed to keep their best efforts out. Their shape meant we mainly had to play on the counter, and although chances were few we managed to scramble a goal two-thirds of the way through the game to force the equaliser. I would love to provide a colourful and scintillating description of it but my view was horribly obscured. I’m assured it was scrappy, though, as our Russian striker at close-range managed to work the ball through outstretched limbs into the corner of the net. With a draw under our belt, we moved on to our second game of the evening against their other team, who had just dispatched our offensive team (possibly in more ways than one) 3-0. Buoyed by the confidence gained by earning a draw, yet slightly apprehensive about the skills of this new team, we took the turf with Lionhead’s blog producers capturing us on camera for posterity and possibly a video diary. And so it began. Splendidly. This time it was Rare that scored early on, with a lovely flowing set of dissecting passes resulting in forced error and an own-goal. Not quite the finish the move deserved, but at times you’ll take anything. We doubled our lead shortly after as a corner was swung in and our Russian front-man was again there to convert the chance. This time, though, it was with a majestic, salmon-like leap into the air to then head the ball past the despairing dive of their keeper and into the bottom right-hand corner. A quality finish, no matter what level you play at. After that it was end-to-end stuff with our defence again severely tested, but in this match we asked some questions of the opposition’s too. Toward the end a defensive error let them run on through to grab a consolation goal, but apart from that minor blip our defence stood firm and we walked away with a solid 2-1 victory. Regrettably, the same cannot be said for Rare’s other outfit as they again went down to a 3-0 defeat: it just goes to show what a solid defence can do for a team. After the final whistle both teams retreated to the bar and began to mingle with their on-pitch opponents, Lionhead obviously the happier having won two of the four games and only losing one of the others. You can’t fault their hospitality, though, because by the time we reached the bar a tab had been started and beer was being thrust into our hands. Very gracious winners. With the return leg somewhere soon in the offing, some trading of players between teams may have to be done to balance things out, but this could be the start of something interesting. There is already talk of friendlies with Liverpool’s Bizarre Creations and other more local studios, not to mention a nationwide developer’s tournament that someone’s caught wind of. Before long we might even be able to get the bus branded with a Rare FC logo, but I think we’re getting ahead of ourselves; I’ll just settle for a new goalkeeping jersey. EDIT: there are now some photos of the day. This week saw the conclusion to an interesting little contest over on Pinata Island, where forum goers were invited to enter the Create-a-Rare-Developer-as-a-Pinata Competition. The rules were simple: pick someone from the game’s credits and create that person as if they were a piñata in the game. With no limits on the mediums that could be used and with the added incentive of mystery prizes from us here at Rare, we always knew the results would be interesting. Those that were posted were indeed varied. From Lego to clay, from pencil to actual piñata, the range was impressive and you could tell a lot of thought, time and effort had gone into many of them. We even had a complete homage to the way the piñata’s information is described in-game, which was particular close to my heart. Of course with every contest there has to be a winner and in this case it was Lazria’s Goldipop which proved popular with the dev team. Mainly, I think, because we can all imagine Andy as a floundering fish, but the thought he inspired someone else to name a goldfish after him is priceless. For a rundown of all the final results, check this link. I am now surrounded by a box full of VP and Rare branded swag that will be distributed shortly to all the various winners. Luckily most of it is reasonably flat and can easily by jiffy bagged but I’m not so sure about the mugs, hopefully they’ll survive the transatlantic post. It was a headline that filled me with dread: GAME acquires Gamestation. A cry rang out from my mouth at the horror; my favourite shop on the highstreet (and bastion for retreat when Ali goes shopping) is being enveloped by one of my least favourite shops on the highstreet. I have always resented buying games from GAME. Even before Christmas when they were the only place in town to have the Wii accessories I wanted, I felt dirty handing over my cash to them. With some shops I have an irrational disdain for them, Starbucks, Costa et al, for example, just because they are always there. With GAME, however, I think they are soulless places for people who don’t know better, who get ripped off on prices and who just bend over and take it when offered a ridiculously scant trade-in price. They are the ultimate, streamlined, capitalist vision of my preferred hobby, not only that but their all-caps name grinds my gears too. This is not to say that Gamestation is not after my money too, let’s not pretend they too aren’t driven by the mighty pound, but they go about it in such a nice manner by comparison. Their shops have character, a great range of second-hand/retro games, good trade-in value and, more importantly, their staff appear to know what they are on about. This could be just my own personal impression, but the difference between the two businesses is as night is to day. The one glimmer of hope I cling to is that they will, as the press release says, keep the two brands separate. For those of you who remember Electronic Boutique, you may also remember that GAME assimilated them pretty sharpish after an acquisition, but hopefully the demographic who use Gamestation (as it is now) as opposed to GAME will persuade the two identities to remain. The odd thing is, though, that as much as I hate GAME’s retail face in towns, I cannot fault their online service. Upon their website, prices can almost be considered competitive and their delivery service is exceptional; if ever I want something on the day of release this is the place I will go. Quite the opposite to Gamestation’s own web presence, in fact, and quite the Jekyll & Hyde. Who knows, they may compliment each other after all.